Information about various awards and where they should be worn. Tigers have a different Uniforming Policy. Click on Tiger Button to find out more! encourages neat, correct appearance as well as good behavior. provides the only place for proper display of awards. provides a visual way for boys to "belong" together. A neat, complete uniform is REQUIRED for most pack activities and all pack and den meetings. This fosters a sense of pride and belonging in the boys. Rank awards are not given at pack meetings to Cub Scouts improperly uniformed or without a parent or guardian present. Uniforms are not to be worn for activities not sponsored by the Cub Scouting organization. Consult with your den or pack leader if you have a question. dark, solid color, long pants without holes, and dark socks (blue jeans are acceptable). The Cub Scout brag vest is optional. Baseball and other hats are not considered part of the official uniform. Cub Scout leaders wear uniforms as an example to the boys and so other Scouts may recognize them as leaders. Pack 3030 will hold a uniform inspection each year as a separate part of a pack meeting. Advance notification from your den or pack leader will be provided. If adjustments are necessary, we ask that they be done quickly. Dens passing inspection will receive a recognition award. Leaders will be inspected too --- by the BOYS! NOTE: "Right" is the wearer's right side. Purchased by the parent. Worn on the top of the left sleeve. Look inside the back cover of your book for proper placement. Purchased by the parent. Worn immediately below the council patch on the left sleeve. Look inside the back cover of your book for proper placement. Purchased by the parent. Worn immediately below the American flag on the right sleeve. Look inside the back cover of your book for proper placement. Purchased by the parent. Worn by Webelos immediately below the American flag on the right sleeve, replacing the den number patch. Look inside the back cover of your book for proper placement. ALL Webelos in a den must receive their Webelos rank badge BEFORE they may wear a patrol patch. Purchased by the parent. Worn centered above the left pocket midway between the pocket and the shoulder seam. Awarded for years of membership. Worn 3/8-inch up from the top of the left pocket to the bottom of the star. Multiple stars are worn 1/4-inch apart. Look inside the front cover of your book for proper placement. The orange background is for a Tiger Cub graduate (1-year); the yellow background is for Cub Scouts (1 to 3 years); the blue background is for leaders; the green background is for boy or girl scout service. Worn centered immediately beneath the bottom corner of the right pocket. Worn on the left pocket. Look inside the front cover of your book for proper placement. Scouts may only earn the rank appropriate for their age. Awarded for every ten electives completed. Electives may be completed at any time; however, the arrows are only awarded after a scout has achieved his rank badge. The gold arrow is given for the first ten electives, the silver for subsequent recognitions. Worn beneath the rank award that the arrows are earned for. Look inside the front cover of your book for proper placement. Beads awarded as an incentive for boys to achieve their rank: yellow for Wolf, red for Bear. The den leader awards one bead for each three achievements the Cub Scout completes. The entire device is worn from the right pocket button. The denner cords are given by the den leader to two boys in the den who are responsible for helping lead the den meetings. The denner cord is a gold double-strand shoulder cord worn on the left shoulder with the cord suspended under the arm. The assistant denner cord has only one strand of braid, but is worn in the same way. The cords are worn only during term of office (usually a month or so, decided by the den leader) and passed to two other boys when the term is up. The cords are intended to foster responsibility and leadership. Purchased by the parent for attachment of Webelos activity pins. Green, red and yellow streamers on a blue metal bar. Worn on the right sleeve immediately below the American flag. Awarded to Webelos who complete 7 activity pins. Replaces the immediate recognition beads on the right pocket button. Compass points are awarded for each subsequent completion of four pins. Awarded to Scouts and leaders in a pack that has earned the National Quality Unit award. Worn on the right sleeve 4 inches below the shoulder seam. Look inside the back cover of your book for proper placement. Only the most recent quality unit patch may be worn. Awarded to a Cub Scout for recruiting a new Scout to the pack. Worn immediately beneath the Tiger graduation patch, or centered immediately beneath the bottom corner of the right pocket. Awarded to Cub Scouts who participate in a den or pack conservation project and who complete certain requirements for their rank. Contact your den leader for information. Worn centered on the right pocket. Awarded for participating in at least 50% of summertime activities scheduled by the pack. Worn on the right pocket flap. Can wear up to four. Awarded to a Cub Scout or leader who completes specific religious activities. Worn immediately above the top of the left pocket with the upper loop of the knot to the wearer's right. Religious medals are not intended for everyday wear, but only for formal occasions. These should be presented to you in a ceremony at your religious institution. Purchased by the adult. Worn immediately below the pack number on the left sleeve. Awarded to leaders who complete basic training. Worn below the leader position patch on the left sleeve. Awarded to a leader who completes training and specific activities during a two-year leadership period. Worn immediately above the top of the left pocket with the upper loop of the knot to the wearer's right. The first knot should be centered above the pocket; up to three knots can be sewn on one line. May be temporarily worn hanging from the button of the right pocket. Clear plastic sleeves are available for purchase from the scout store. 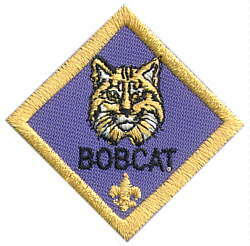 Once worn for a short time (30 days), then the patch is sewn or glued onto the brag vest or camp blanket. Are given by the pack to parents whose boys earn the Tiger, Wolf, Bear, Webelos, or Arrow of Light awards. The pins are worn on a blue and gold ribbon pinned to the parent's shirt. Only one pin is given for each rank.